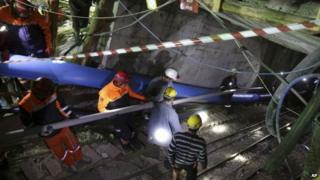 Rescuers are losing hope that 18 workers, trapped underground at a coal mine in southern Turkey, can be saved. Part of the pit flooded while the miners were working. They are said to be stuck 300m (980ft) underground. The accident comes less than six months after 301 workers at Soma died in Turkey's worst mining disaster. Turkey's President Recep Tayyip Erdogan has cancelled his Republic Day celebrations to visit the mine. The PM is also due to go to the scene. The latest accident has raised further questions about safety at mines in Turkey, which has seen several fatal incidents since 2000. Emergency workers at Ermenek in southern Karaman province, 400km (250 miles) south of Ankara, have been trying to drain the pit after the mine was flooded by some 11m litres of water. At least 16 miners managed to escape. One told local media that it was third flood that had taken place at the mine and blamed a lack of safety measures in place. President Erdogan cancelled his planned presidential reception, due to commemorate the 91st anniversary of the Turkish Republic, as details of the disaster became clear. Mr Erdogan told reporters he would carry out inspections of the scene along with Turkish Prime Minister Ahmet Davutoglu. In May, Mr Erdogan visited the Soma mine while still prime minister and came under heavy criticism for what people saw as an insensitive response to the high number of deaths. Scuffles broke out as his car was attacked and an aide to Mr Erdogan appeared to kick a protester. Wednesday evening's event was to be held at the newly-built "Ak saray" (white palace) complex. Construction began on the building when Mr Erdogan was prime minister. Despite court orders demanding that he stop construction, building work continued in the environmentally protected zone. The palace - originally intended to be the prime minister's office - occupies 200,000 sq m and is rumoured to have cost $350m (£217m). Prior to the disaster, opposition leaders said that they would boycott the reception.